The newest and most advanced Spray on tan booth in the world! Versa Spa open air design spray booth with a fine misting spray and blow dry finish. Choose to do just your legs, your face or your whole body. Choose from 3 different levels: clear or bronzer spray, followed by an anti-aging hydration spray treatment. Choose from 3 different color levels: medium, dark and extra dark. Voice prompt instructions, 100% Automated, 100% Privacy! Perfect spray tan in just two minutes! Single tan price for the Versa Spray Spa is $30.00 and as low as $14.97 per spray tan with our best value tanning package. With the Matrix 360 Tanning Bed, you will see the color difference immediately! While conventional tanning beds require 8 to 15 visits to establish a base tan, the Marix system only requires 3 to 5 sessions.The matrix success is attributed to the fact that they have more tanning power than any competitive product. The proprietary filter glass and high-pressure sunlamps used in Matrix tanning systems provide the optimum number of the tanning photons necessary for a deep, dark and long-lasting tan. High-pressure tanning system emit more of the longer UVR wavelengths that penetrate farther into the skin melanosomes located deeper in the skin. Since it takes these melanosomes longer to reach the surface of the skin, the tan lasts much longer and appears deeper and darker. Most people find that they can maintain their tan in a Matrix High-pressure tanning system by spacing the sessions approximately one to two weeks apart thus saving money over regular tanning units which you need to tan 2-3 times per week to maintain your tan. Think of all the valuable time and money you will save! Single Tan price for the Matrix HP is $35.00 and as low as $18.71 with our best value tanning package. High pressure tanning is an exciting new alternative to traditional indoor tanning. The high pressure tanning system uses "high pressure" quartz lamps as opposed to "low pressure" conventional fluorescent tubular lamps. High pressure tanning is able to provide a faster, deeper longer lasting tan than conventional tanning with a greatly reduced risk of sunburn. How does High Pressure Tanning Work? Humans normally exfoliate (shed) their skin about every 28 days. Constant exposure to UVB light in conventional tanning beds accelerates this cycle to somewhere between 5 to 10 days. Since UVB light tans only your outer layer of skin which exfoliates every 5 to 10 days, your tan fades if left more than just a few days go by between tanning sessions. Also, in response to UVB, your outer layer of skin thickens as a natural barrier to further UVB exposure. High pressure beds tan with virtually 100% UVA rays, allowing your skin to return to its normal 28 day cycle. High pressure tanning also tans deeper, so even as your other layer exfoliates, the layer beneath is still tan. Simply put, UVA is a deeper penetrating ray than UVB. Unlike UVB that hardly penetrates deep into the levels of elasticine and collagen, the connective tissue of the skin. With almost pure UVA which is the bronzing ray you will achieve a deep dark tan with out burning because of little UVB the redding and burning ray. High pressure lamps increase the amount of energy that is released so that the tanning process is triggered in much less time. One 15 minute session in Matrix bed or 10 minutes in the Stand Up Saturn unit could be compared to 8 to 12 sessions in a conventional low pressure bed, or 4 hours in midday summer sun. Saves time: With fewer tanning sessions needed think of all the time you will be saving! Fewer sessions: Means less overall exposure to ultraviolet radiation. Save money: You will achieve your tan in just 3 to 6 sessions and your tan will last 3 to 4 times longer, so you will save time and money by not having to tan as often. Relaxing: In the Matrix bed, all the UV rays come from the top and bottom of the unit or 360* degrees, which makes for a total of just a 15 minute session time. This makes the tanning experience less like artificial tanning and much more like sunbathing at the beach. On the go: If you don't have the time for the Matrix bed, then try the Saturn Stand up High Pressure unit. 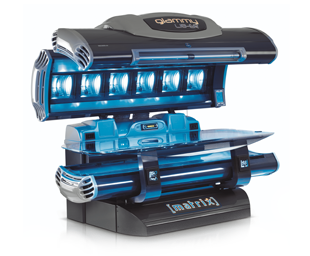 This is a 360o degree tanning unit that will tan both sides of your body in less than5 minutes time of the Matrix bed. Total tan time is just 10 minutes and the results are the same as our Matrix bed. This is a great tan for clients who are on the go. 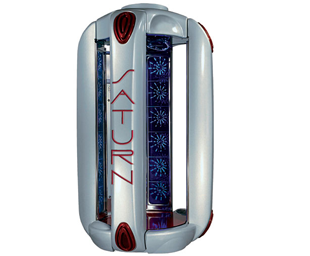 The Saturn is also equipped with a facial tanner that can be adjusted to your height and can also be used as a shoulder tanner half way through your session. Comfortable: When tanning in the Matrix bed, you will be relaxing on a large flat acrylic, similar too traditional low pressure beds. Also with the Saturn you will be standing up during your session which does away with pressure marks and lines under your arms and no sweating. 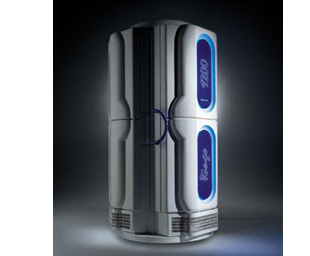 Cool: Both High Pressure tanning units are cooled with built in cooling systems. There are dual speed body cooling fans that can be adjusted to blow cool air over your entire body. There is very little perspiration and you get no unpleasant tanning smell. Want an immediate, long lasting tan? The Saturn Standup is the right choice coming in at about SEVEN times more powerful than many other tanning beds. The Saturn is a 10 minute high pressure tanning unit that offers intense tanning power for a deep, dark tan that lasts 2-3 weeks from a single session! This is the most powerful high pressure stand-up available on the market today, giving unsurpassed tanning without increasing your chance of sunburn. Key Benefits: *Equal to about 4 hours in midday summer sun. *Lamps: 25 intense high pressure lamps. *10 minute session time. *Extra tall. *Open air design for advanced cooling. With the Ringo Mix Stand Up unit you will get all the same benefits of High Pressure tanning in just half the time! With its 360 degree design you will be able to get all sides of your body tan in just 13 minute sessions, which is half the time of our N'Joy High Pressure Bed. While conventional tanning beds require 8 to 15 sessions to establish a base tan, the Ringo Mix only requires 4 to 7 sessions depending on your skin type. Maintaining your tan has never been easier. Just one visit every week or 10 days and you will maintain your beautiful tan. Single price for the Ringo Mix is $20.00 and as low as $9.98 per tan with our best value tanning package. 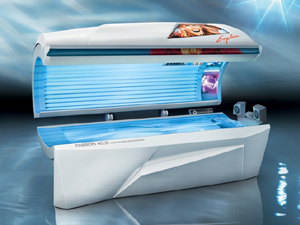 The Ergoline Passion 40/3 Turbo offers high-end tanning performance and comfort. The strength of this tanning bed is its 40 turbo/super power UV lamps, three 400-watt glass reflector high pressure units. This combination guarantees an intense and long-lasting tan. 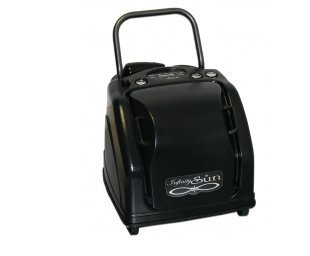 This powerful tanning bed has a great cooling system that allows to relax and enjoy your tanning session. The attractive appearance of this bed is very cool, and will give you an incredibly dark tan that you’ll love in only 12 minutes time! Single tan price for the Ultra Ruva bed is $14.00 and as low as $7.24 per tan with our best value tanning package. Our Infinity Sun Custom Airbrush Tanning will give you a beautiful natural-looking tan. Our Airbrush Tan is performed by one of our technicians and is customized for you. Tell us want you want and we Airbrush you accordingly. Lighter face, darker legs, or contoured stomach –you choose your tone! Our Airbrush System is the perfect answer for those who want a beautiful custom tan today- best for Weddings, Parties, Proms, Vacations and Special Events- or just for a great looking tan! Single Custom Airbrush Spray is $45.00 and as low as $24.95 per Airbrush with our best value tanning package.